Univ.-Doz. 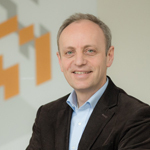 Dr. Siegfried Reich is managing director and head of research at Salzburg Research as well as senior researcher working in the area of hypermedia middleware and Web Engineering. He received his M.Sc. in applied computer science from the University of Linz (1992) and a Ph.D. in computer science and economics from the University of Vienna (1995). From 1996 – 1999 he joined the Multimedia Research Group at Southampton (UK) as a post-doc and lecturer mainly working on interoperability of distributed open hypermedia systems and the application of software agents for navigating information spaces. From 2000 to 2003 he was head of SunTREC Salzburg, a research centre initiated by Sun Microsystems and Salzburg Research in the area of middleware frameworks for Web-based applications, including mobile applications using the Java platform. Since 2003 he is head of research and director of Salzburg Research, the research institute of the county of Salzburg. Sigi Reich has published over 80 international papers and has served as referee for many journals, conferences and workshops. He has been involved in several European and national research projects. He is a member of ACM, IEEE and the Austrian Computer Society OCG. Detailed CV and list of publications. Ranacher, P., Brunauer, R., Van der Spek, S., Reich, S.	(2016): A model to estimate and interpret the energy-efficiency of movement patterns in urban road traffic	In: International Journal of Computers Environment and Urban Systems (CEUS), 59, pp. 152-163. Ranacher, P., Brunauer, R., Trutschnig, W., Van der Spek, S., Reich, S.	(2015): Why GPS makes distances bigger than they are. In: International Journal of Geographical Information Science, 09/2015. Meinhardt, S., and Reich, S.	(2012): Mobile Computing	In: Vol.~286, dpunkt.Verlag, Heidelberg.